In lieu of U.S. election coverage, I present to you a few notes and photos regarding Saturday’s pizza night chez nous. 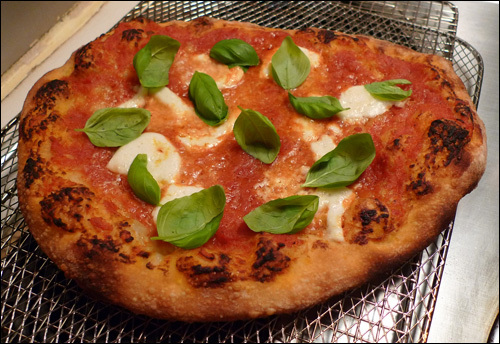 We always start with the classic and zen-like pizza Margherita, which, when done right, can be a truly joyful thing. I attempt to do it right by using a very simple sauce composed of only drained, then ground, San Marzano tomatoes, a couple of tablespoons of good olive oil, and a bit of salt and pepper. That’s it. No cooking, no nothing. Just top notch-Italian tomatoes with a bit of oil and seasoning to make it sing. It is important to drain the tomatoes through a wire sieve first, as almost a full cup of water will come out. A too watery sauce will make your pizza soggy (something I wish they’d learn at Bottega, supposedly Montreal’s finest pizzeria). This Margherita was also blessed with real mozzarella di bufala, which is expensive but worth it. As you can see, 125 grams was enough for this roughly 12-inch pizza. Finally, it was topped with fresh basil plucked from a living plant. And naturally, the basil was added after the pizza came out of the oven. The second pizza was a real eye-popper. 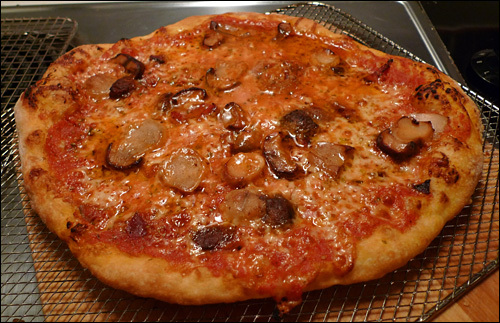 Same crust, same sauce (but slightly less of it and dressed lightly with some dried oregano), then topped with grated Friulano cheese, pan-crisped pancetta maison, and big hunks of porcini mushrooms. In this case the mushrooms were frozen (and thawed, of course) as that amount of fresh porcinis would have cost about $20, if you could even find them. The cheese, Friulano, is an Italian inspired Canadian cheese that is sort of like mild cheddar but slightly nuttier tasting. I usually go half-and-half with mozzerella, but I had no mozzarella left. The only downside to the Friulano is that it’s very oily when you melt it (as you can see), but if you can forgive yourself it’s mighty delicious! I wish I were a good enough bread man to make my own dough, but I’m not so I don’t. For the past year I’ve been using the fresh pizza dough from Milano, on Boul. St. Laurent in Little Italy (Montreal). I find it works remarkably well, and has never let me down. It rises up nice and soft inside with a definitely crispy exterior, just the way I like it. OK, now that we’ve had dinner, it’s back to that election coverage. How come the two of you don’t weigh 500lbs, collectively? Pffffft. Ouf. Sweet, sweet, sweet. Them’s some nice-looking pies, my friend . . . Milano’s sounds great for the dough (yeah, it’s too much of a drag making the dough–kind of like having to make your own cheese) but the stuff I get at the pizzeria at Atwater is great! But if I’m in the neighbourhood I’ll try Milano. And you’ll have to post a full recipe including method etc. (how you get the pizza off the peel etc.) after the next session. @Lisa: we are dangerously heading towards that 500lbs mark… It’s SO hard to resist seconds! Nick, I had mentioned to Martine that she should video me making the pizza (as a follow-up the the comments on your blog) but practical necessities prevented it this time. Too bad, because it worked out brilliantly. Maybe next time!